I am not a naturally organized person. If left to my own devices, I forget important events, run late, forget to make dinner and end up in the drive through, and have a mountain of laundry in no time. Organization and neatness just doesn’t come easy for me. If you have that organized gene in your body, God bless you. I don’t, and it has taken much hard work to get our home to a state where we function well. Let me tell you, life is so much easier when there’s a system to the madness. It takes time to develop good habits. It won’t happen overnight for most people, but you can keep plugging away, one thing at a time until you have created great habits that just seem natural to you. It’s a bit like auto-piolet once you get into a routine. I homeschool our children and work from home, but we still have co-ops and weekly get togethers throughout the week, so we are not just lounging in our pajamas all day. 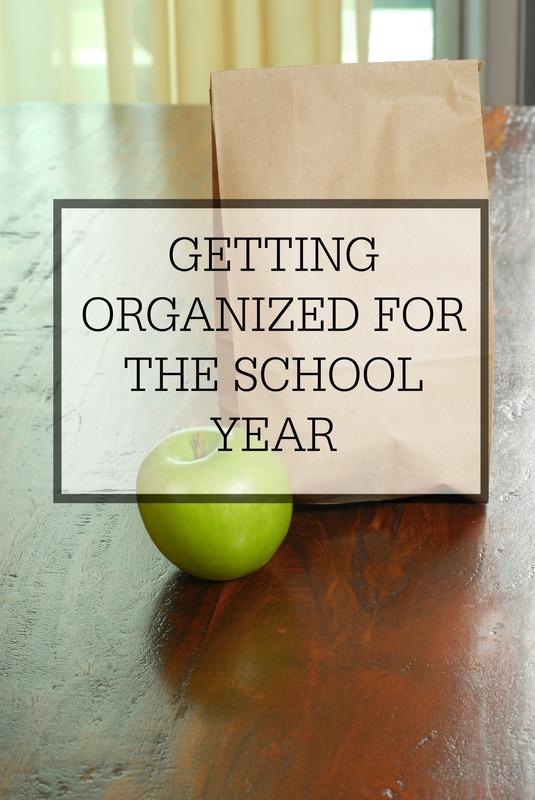 We have to be organized if we want to make it through the school year with some sanity left. I can imagine that those of you with children in public school, private school, daycare, homeschool, or any other scenerio are the same way. Here are my best tips for getting organized for the school year to keep our homes running efficiently. 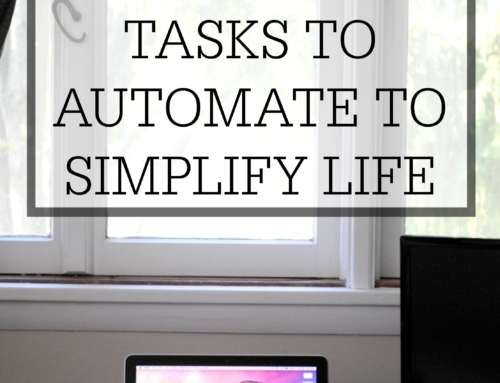 This simple frugal command center in my kitchen has transformed my home. I fill it out at the beginning of month and all of our commitments, meals and to-dos get written on this calendar. It’s so helpful no longer having invitations and important event papers all over our refrigerator or piled on our counter. They used to get lost or forgotten. Now they are all in one central location so we are all on the same page. 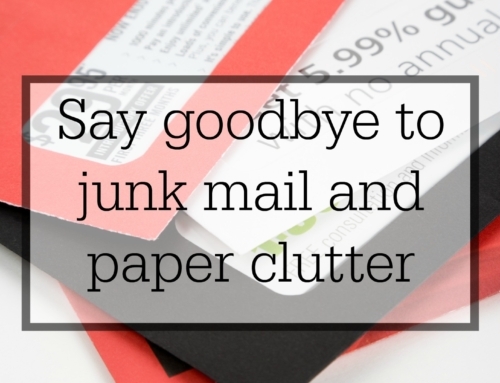 Our mail gets immediately dealt with: recycling, in the to-pay bin, or the to-file bin. Also my children’s chore charts are in plain sight too and they run through their morning chores right after breakfast which takes about ten minutes. Taking thirty minutes on the weekend to plan your meals and create a shopping list for the week is worth it’s weight in gold to keep you out of the drive through and keep money in your wallet. Here is how I meal plan. It’s a simple plug in system. I now have streamlined and automated even more and order all of my groceries online from Green Bean delivery (affiliate link). They get delivered on Friday afternoon and stay in a cooler on my front porch until I get to them. It has simplified my scheduled greatly. Instead of taking an hour to grocery shop, I am now done in fifteen minutes and never have to leave the house. Buying groceries in bulk online is also a good idea. Azure standard, Amazon, and Wilderness Family Naturals (great price on coconut oil) are great sources for that. For meat, I purchase once or twice a year in bulk from local farmers and stock my freezer. Another helpful thing to do is to heavily rely on your slow cooker. Here’s a big fat list of real food slow cooker recipes to give you some easy dinner time inspiration. Large batch breakfasts for the entire week are so helpful when school starts rolling so I don’t have to think about much in the morning when I am barely awake. I am not at all a morning person. The brain cells just aren’t firing very well in the early hours of the day. It’s so bad that during the summer, my husband makes breakfast most mornings. He is a part time PE teacher so when school is back in session he is not here to make breakfast. It’s helpful to have two make ahead items for the week to just reheat. Breakfast burritos, egg casserole, smoothie packs, muffins, stuffed biscuits, breakfast sandwiches, granola, baked oatmeal, pancakes and waffles are all excellent and wholesome breakfasts that are easily reheated throughout the week. It’s honestly just as fast as a bowl of cereal and contains much more nutritional value. It’s also helpful to have a natural rhythm for the week. Please do not overcomplicate lunch. It’s the easiest meal of the day at our house. The majority of the time, it’s leftovers that get reheated and stuck in a thermos. If there are no leftovers or we just aren’t feeling it the next day, I make a sandwich. I buy an organic sourdough bread or crackers if I didn’t have time to make it myself. I also like to keep on hand good lunch meat like Applegate, some organic sliced cheeses on hand, and some natural peanut butter/nut butter/sunflower seed butter. Then I throw in two or three sides: sliced vegetables with dip, cut up fruit, guacamole with organic tortilla chips, homemade popcorn, homemade granola or bars, peanut butter balls (oats, honey, peanut butter, chia seeds), yogurt, applesauce, etc. It’s all stuff already in my fridge and pantry so there’s no extra work. So a typical lunch would be leftover tacos, fruit, and guacamole with chips or carrot sticks. The meat would be reheated while we are eating breakfast and put into a thermos. The rest (tortilla, fruit, guac, and carrots) would be packed up the night before. If I didn’t have leftovers, I would make the night before a ham and cheese sandwich, strawberries and grapes, and peanut butter balls. You get the idea. If your kids are beyond six or seven, they can probably even pack their own lunch as long as you give them some parameters. I’m all for teaching kids to be independent. 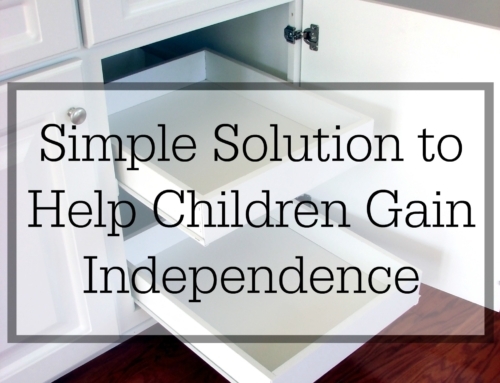 Consider creating a snack bin and cabinet for your kids that is on their level so that they can retrieve their own snacks. A few homemade yogurt jars with fruit on the bottom, vegetable sticks with ranch dip, small jars or bags of cut up fruit, homemade jello cups, string cheese, beef jerky, organic crackers, homemade granola/energy bars, etc can be put in a central location or basket, and then they can just grab what they wish for a snack after school if you allow it. I am a huge fan of household systems and chores for the entire family. Getting everyone involved and pulling weight in the house makes the home run much more smoothly. It doesn’t have to be complicated. 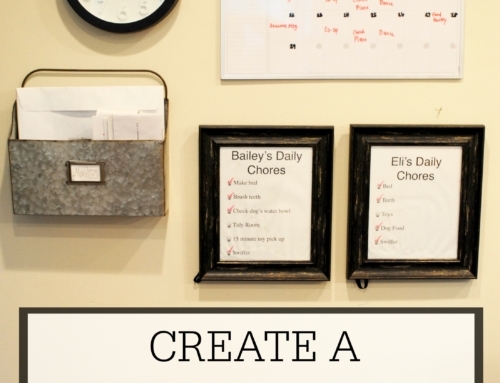 Just create a list of daily chores for the kids, a list of daily chores for the parents, and a list of weekly cleaning duties for the whole family. 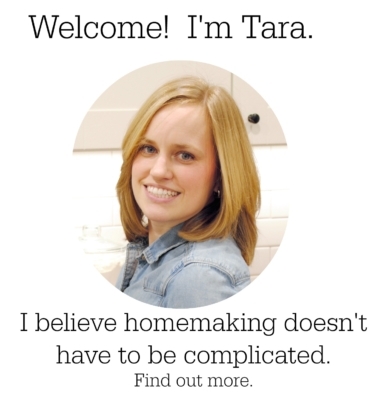 Here are five things that I do every single day no matter what to keep the house livable. I printed our children’s chores and put them in simple frames so they are dry erase check lists hung on the wall under our command center. It has worked beautifully. Set out your clothing the night before. The kids can do this themselves. Have a plan for tomorrow’s dinner and bonus if it’s already prepped and in the slow cooker in the fridge. Have lunches made and in the fridge or ready to be heated up and thrown in a thermos. A little planning the night before goes a long way to having a successful morning. When I don’t plan the night before, I am a mess the next morning and always ten steps behind. I adore my hooks that my husband installed a couple of years ago. It is so handy having everything up off the floor and right by the door. No longer are we searching for backpacks, purses, jackets, or keys. As soon as we get home, they get put right back where they belong until we need them again. 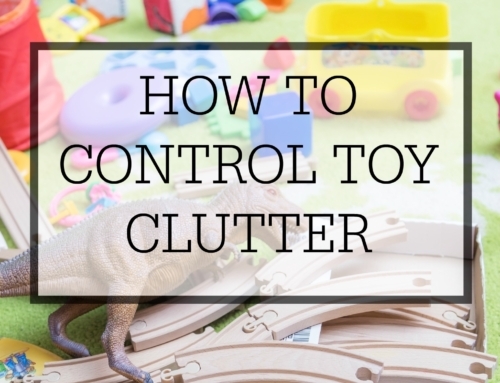 I hope you find these tips and household systems helpful. They aren’t complicated and don’t require a lot of time or money, but they will make a huge impact in your home. Have a great school year! And just a reminder. Full grace to all of you mamas and daddies just trying to keep the kids alive. You are doing a great job! Don’t be so hard on yourself.